Welcome to Eat Your Greens Round Up #2. This is a new monthly vegetarian cooking challenge for food bloggers. The 'Eat Your Greens' challenge was launched only last month. 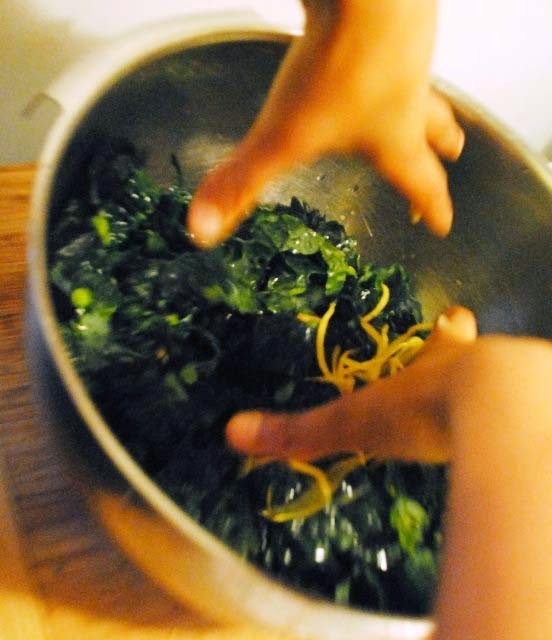 The idea behind 'Eat Your Greens' is really simple, to make something with a green vegetable each month. 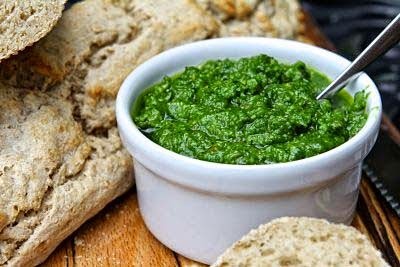 You can use any kind of green vegetable that you like and make anything that you wish from a soup, salad dish, a smoothie, a stew, a curry, a pasta dish, cookies or even a cake (sweet or savoury) - absolutely anything, so long as the recipe is vegetarian, vegan recipes are also welcome. Culinary adventures with Camilla shared some Kale had a hard day salad. So why is it called kale had a hard day salad? Well you will just have to go by Camilla's blog and find out. It will make you smile, promise. 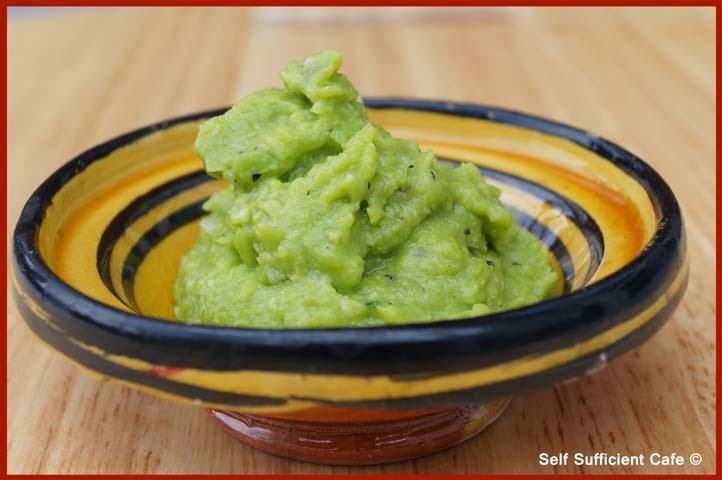 Jasmine from Self Sufficient Cafe sent in a beautiful green Broad Bean Dip made with her own home grown broad beans. Now what to dip in this light and fresh bowl of deliciousness, maybe some vegetables crudites to keep up with the healthy theme! A beautiful basil pesto from Kate at Gluten Free Alchemist. The herb in this pesto is basil and yes, herbs are permitted in #EatYourGreens. The original recipe is made with Parmesan and most vegetarians know that this hard cheese is made with animal rennet and therefore not suitable for vegetarians , but the lovely Kate has offered replacing this with a vegetarian alternative. Kate also made some rustic gluten free baguette - perfect to eat out in the garden and watch the birds, that is of course if they don't start eyeing up this bread too. A gorgeous green, delicious and fragrant Pea and Mint Soup from Katharine who blogs at Leeks and Limoni. Katharine used homegrown mint that is just taking over her garden plot, she writes 'although I was very liberal in my use of mint, it doesn't overpower the delicate flavour of the peas'. We salute you Katharine, well I certainly do. Next up are some pasta dishes. The first two are made using the bushy broccoli heads and the stalks! 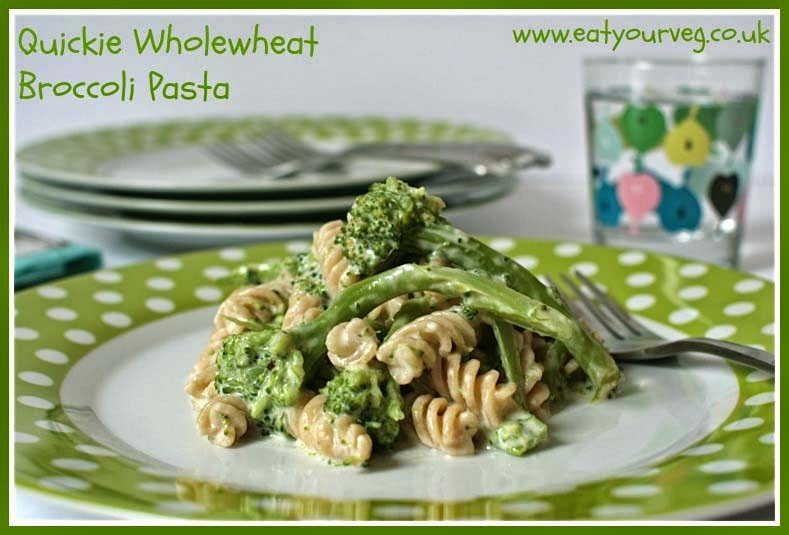 Something to put together in 30 minutes or less , a Quick Wholewheat Broccoli Pasta from Lou Foti from Eat Your Veg. I can see this one appearing on my table very soon. 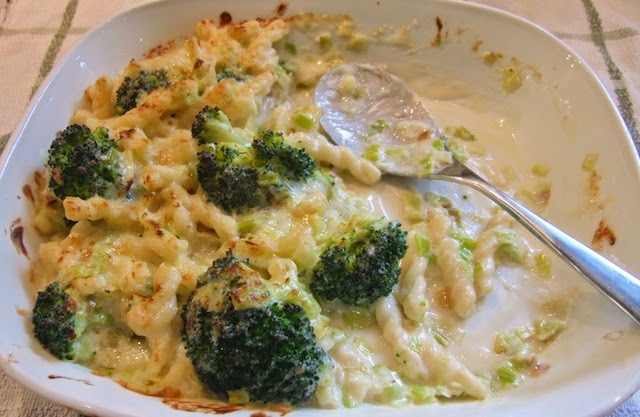 The second pasta broccoli entry comes from Helen at Family - Friends - Foods with a Broccoli, Leek and Cheese Pasta Bakes. 'More broccoli Mummy' really is not what a mother often hears, yet Helen heard this from her little one. Validation that it must be good. I like this picture, it looks like I am tucking into it myself. Yum. 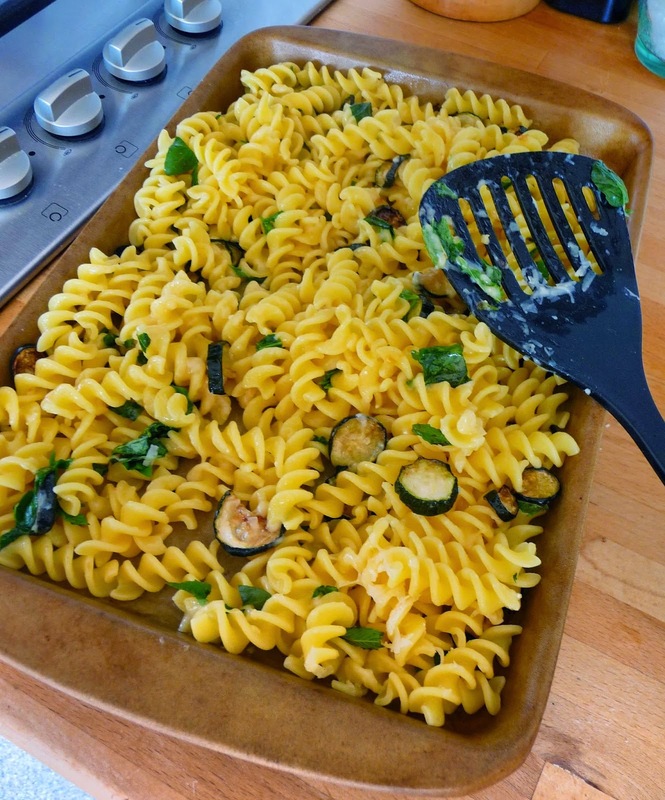 A frugal, yet delicious dish aptly called Ragbag Pasta with Roasted Courgette, Basil and Mint comes from Linzi who blogs at Lancashire Food who has been wondering what to do with all those courgettes that are starting to come from her garden. The pasta is gluten free too. I think this would be perfect for the lunch box too. 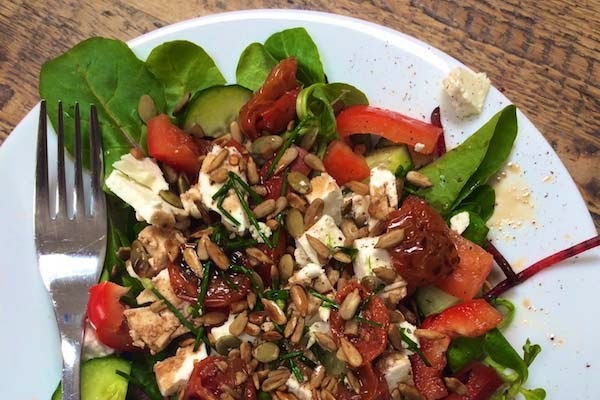 Katie from Feeding Boys and a Firefighter sent us a Salad made with Feta and Sunblush tomatoes. Not only is it speedy, its healthy and so colourful. Her use of both fresh tomatoes and sun blushed could have also made an appearance in my Vegetable Palette Challenge, where the theme is Summer Reds. 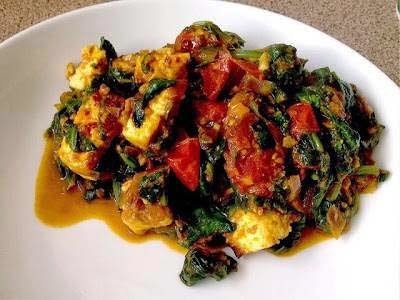 Ray from Garlic Buddha shares a lighter and summery version of an Indian dish called Palak Paneer - Sunny Spinach and Paneer Dish. The red from the tomatoes definitely make this dish even more appealing. I will be bookmarking this to make in the near future as its lightness from the spinach appeals to me. Next, a delightful Sprouted Forbidden Rice Salad with Pecans, Cranberries and a Zippy Citrus Dressing from Style Nectar: Living Beautifully. Forbidden Black Rice and Wild Rice are both still relatively unknown to those of us living in the United Kingdom, and the fact that you can sprout it is a revelation to me. Ah so what is green about this dish, some of you may ask?! 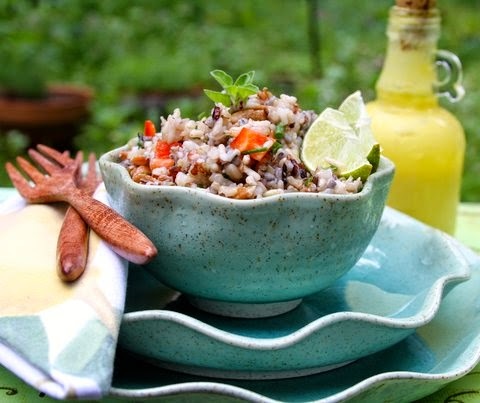 Well, my dear readers Juliane has verified this 'wild rice is the seed of a grass that grows in shallow lake waters and streams around North America...The seeds are obviously start out raw at this point and they are green and plump' - so clever and so informative and so healthy and good for you. And finally a light, yet delicious snack that will take you on a culinary journey to Cyprus. These shallow fried Courgette and Feta Cheese Fritters comes from the lovely Karen at Lovage and Lavender. 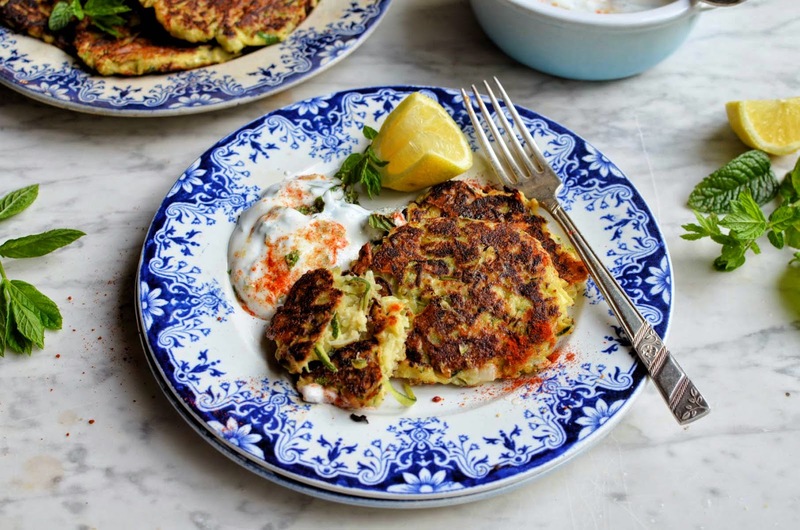 These courgette fritters are made with Beyaz Panir a Turkish white cheese similar to feta. The firtters are served with an a creamy Chilli Mint Yogurt Sauce. Thank you so much to every one who has participated in this months Eat Your Greens blogging challenge. Please, please do go on over and check out each entry one by one and leave a comment. Please also feel free to share your recipes for August now. Follow this link for the details. PS If I have missed anybody out, please let me know and I will link up immediately. What a wonderful round up of healthy dishes! So glad I stopped in on this post! I have bookmarked the Broad Bean Dip and the Spinach and Paneer! Thanks Susan, oh I am so pleased that you have bookmarked some recipes here, hope to inspire you more in the near future. Hope your well. Thanks Peace Patch. So glad that some of the recipes have leaped out you. Thank you Wendy. Def.nice to catch up. Hope you can participate in near future. I can eat 'em all up. Chandra, hope you can participate in near future too.